The following is some of my personal dimensional brainstorming. I think in images, so I am going to provide as close of visual imagery to approximate my imagination as possible. I think I my need to hire myself a graphic artist. The fabric of space IS COMPOSED of counter-space. Aether is this weird thing because it is coutnerspacial. However if counterspace is manipulated/polarized just right it manifests itself into space. Matter and all tangible energy in space comes from and is a polarization of counterspace. It is very difficult to talk about space without referring to counterpace. Counterpace is the structure (archetype) upon which space itself is manifested/constructed. 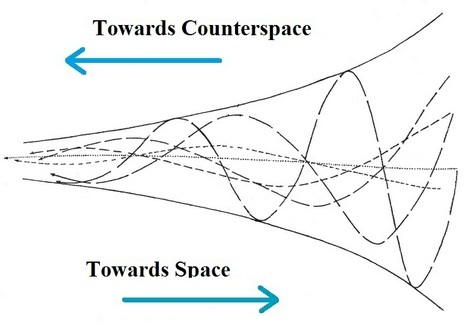 Space and counterpace are like two unique sides of the same coin, the sides may be different, however they are inherently linked. This can make conceiving of these things and then trying to articulate them, rather challenging. All duality frames have two different ways they manifest and thus their unit measurements are also be different. Although they may be referring to the same coin. Or in math speak conjugates. Raui and myself talked to each other in circles about the concept of duality and how it relates to just about everything. Nature is not governed by laws, rather it is governed by mutually interactive reciprocities. Counterspacial phenomena can be thought of as a process of folding inwards infinitely. Spacial phenomena can be thought of as a process of folding outwards. Personally I believe this folding process occurs vortexially. In any case back to Mutual Induction. As Garrett said it is FLUX LINES INTERACTING ON OTHER FLUX LINES. This is sort of how I envision mutual induction might work counterspacially. 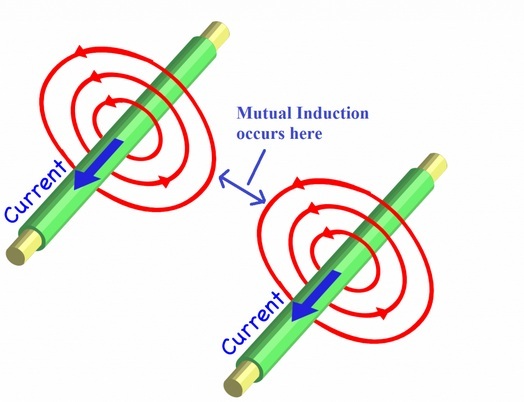 Mutual Induction is a flow or transfer of energy. Remember the standard magnetic field lines “L” is the storage of energy. The following wormhole represents the transfer of energy from one magnetic line to another. It probably happens orthogonally as well since 90 degrees appears to be a magic number like phi. So in a way energy disappears from Point A in space into counterspace, re-emerging from counterspace into space at Point B. On another note. Talking to Jim Murray defined Reluctance as the inverse of Inductance. “Tesla did not invent the idea of electrical resonance. Itwas inherent in the mathematical description of the condenser discharge as developed by Lord Kelvin, and in the physical nature of alternating currents; but Tesla changedit from a buried mathematical equation to sparking physicalreality. It is the analogy of acoustical resonance which is a natural property of matter. However, there were no practical circuits in which resonance could manifest itself until Tesla developed alternating currents, particularly the high-frequency currents. He put the master’s touch to the research in this field by developing the principle of resonance in individual circuits through adjustment of capacity and inductance; the amplification of effects by inductive coupling of two tuned circuits, and the peculiar manifestations of resonance in a circuit tuned to a quarter of the wavelength of the energizing current. This latter development was a stroke of pure genius. In the vibrating string, two loops measure a complete wavelength and one loop measures half a wavelength, since one of the loops is up when the other is down. Between the two loops is a nodal point which does not move. From the nodal point to the top of a loop is a quarter wavelength.Taking the quarter wavelength as a unit, one end is motionless and the other end swings through the greatest amplitude of vibration. By tuning his coils to quarter wavelengths, one end of the coil, Tesla found, would be entirely inactive while the other end would swing through tremendous electrical activity. In order to understand mutual inductance and therefore how longitudinal propagation arises within the secondary of the Tesla Magnifying Transformer it is crucial to understand how it relates to standing waves, especially the quarter wavelength component of a standing wave. First lets start with a stereotypical AC standing wave. A standing wave is created by sending a wave in one direction and then it REFLECTING back upon itself. Having a mirror like reflection point is key in order to create a standing wave. Image from Patrick Kelly. 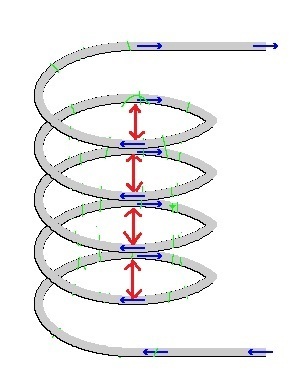 The Standing wave is the resultant combination of the two opposing travelling waves. Superimposition. The red points are the nodes, the maximal swing point is the anti-node. I can’t post the following animation here because it is a Java applet, however please click on the link and watch how a Standing wave is created in Slow Motion. What is important to note is that at certain points along the perimeter of the circular wire there are massive voltage fluctuations, and NO voltage fluctuations at the nodal points. The secondary of the TMT has multiple loops of wire stacked on top of each other. So now imagine how if each one had a Standing wave on it what that might look like. If they are aligned it would look the same..or uniform all the way down. If the standing waves were out of sync, it would look more like a haphazard jagged saw blade. I believe the key to proper TMT tuning is to have all the nodes and anti-nodes on each winding line up with all the nodes and anti-nodes of the other windings. This in effect is that separate standing waves are synchronized with each other geometrically and spatially. Now the important thing to note here is that the TMT DOES NOT USE AC WAVES. Thus all the animations/pictures above are WRONG. They merely convey the concepts. 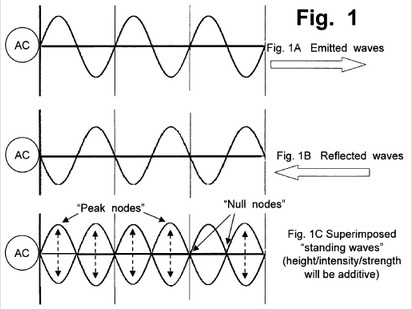 Tesla used IMPULSES in his TMT to create standing waves/oscillation. These are quite a different animal than AC waves and look VERY different. Ok, so now what does a standing wave of quarter wavelength look like in a TMT? 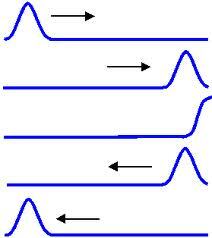 First lets relate how an Impulse wave compares to an AC sine wave. Notice how the 1/4 wave length is in a different spot for the impulse compared to that of the sine wave. This is very important because the maximum amplitude point is of crucial importance. 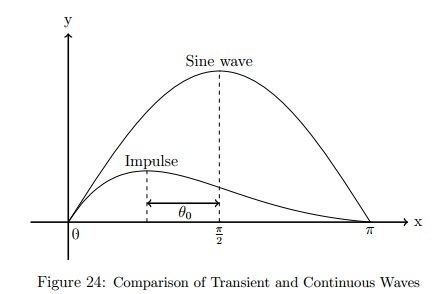 The quarter wavelength for a sine wave is DIFFERENT than that of an impulse. Now this is more like how I Imagine an unidirectional impulse wave creates a standing wave. The forward wave and the reflected wave compound on each other giving power magnification. So not only is an impulse compress energy in time, when an impulse superimposes itself upon another impulse…well you get some massive power amplification. A Standing Longitudndal wave in the aether or any medium such as a wire probably looks more like this. A Java Animation representation of the above – pleas click. What is important to note is the zones of compression is where maximum amplitude exists of the impulse wave. I hypothesize that the compression points are Peak L activity and Peak C activity in unison. The Red Arrows represent zones of compression or peak nodal points of Mutual induction (M) and Capacitance (C) from one impulse peak to another adjacent impulse peak, from one winding to another. It is hypothesized that the longitudinal waves travel orthogonal or at 90 degrees to the direction of propagation of the impulses along the wire. Thus in a way it might be likely to suppose that you have TWO standing waves here. One travelling along the wire, and another being created at 90 degrees. What’s interesting here, and of course this all hypothetical talk, is that if Mutual inductance is occurring in counter space at 90 degrees to L then, it is directly in line with C. M and C are now in phase. The two lines of force are now geometrically aligned. M in counterspace and C in space. This is because the dielectric lines of force naturally jump across the space between the winding’s, attaching themselves to the conductors on either side. This creates a rather interesting picture. We have a magnetic transfer of energy phenomenon happening in counterspace, and a naturally counterspaicial phenomena of Dielectric occurring in space. Regular L…magnetism appears to be left behind, and really is of only use to creating M. What happens with K!? Does that play a part in this? 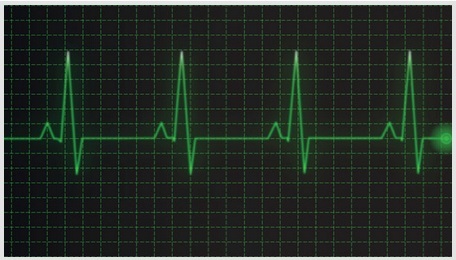 That is an impulse waveform…..and it’s a heartbeat! Nature as its source of power operates using impulses, not sinusoidal AC. Tesla was really onto something here. The impulse is another one of those fundamental archetypes of the universe.